These are almost TOO easy! Which is perfect for the holiday season as things get crazy around this time of year. That being said, I only had to buy a few ingredients for this delicious wonder. So enjoy! This is a great homemade gift idea as well and isn’t as labour intensive as making eight billion different types of cookies! 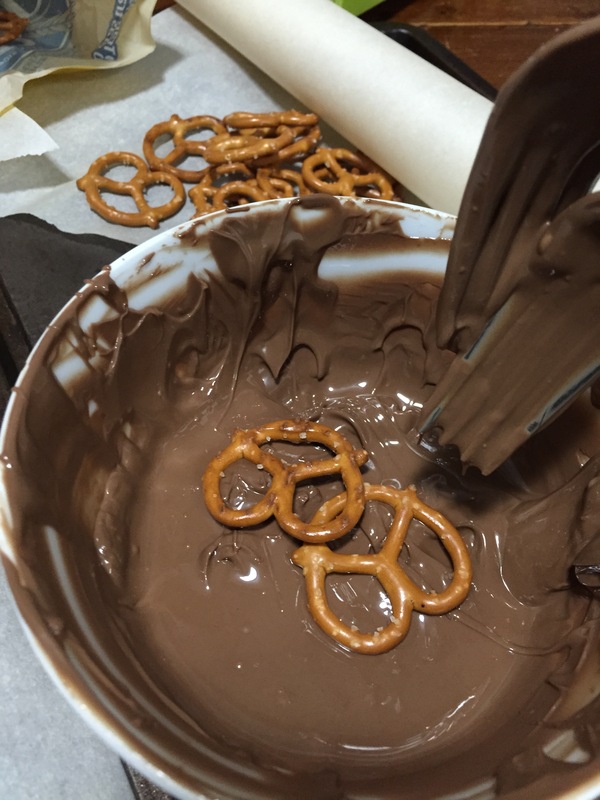 Start by melting the milk chocolate in a microwavable bowl. I start by putting it in for about 18 seconds, stirring and repeating as many times as possible to get the right consistency. Then I drop two pretzels in at a bowl (I find its easier than dumping a whole handful in the chocolate). 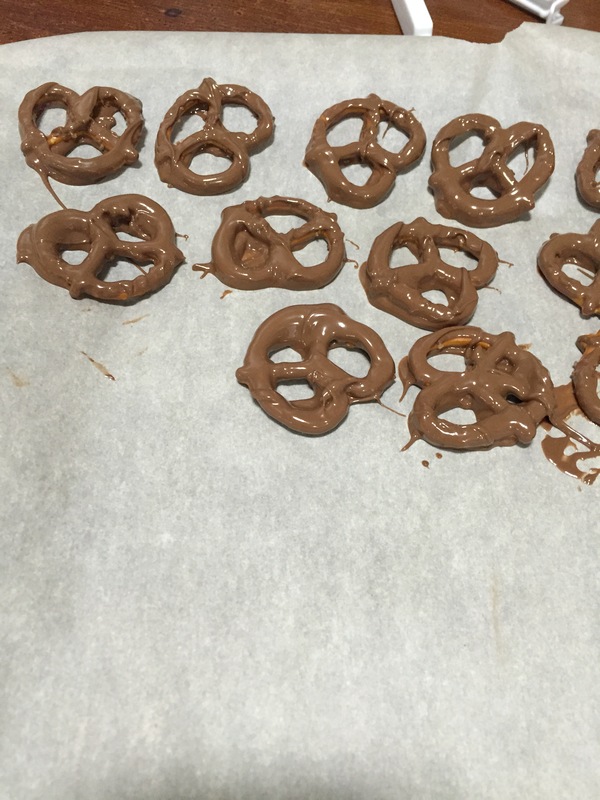 I slightly press the pretzels into the chocolate, then using the forks, flip them and slightly press again. 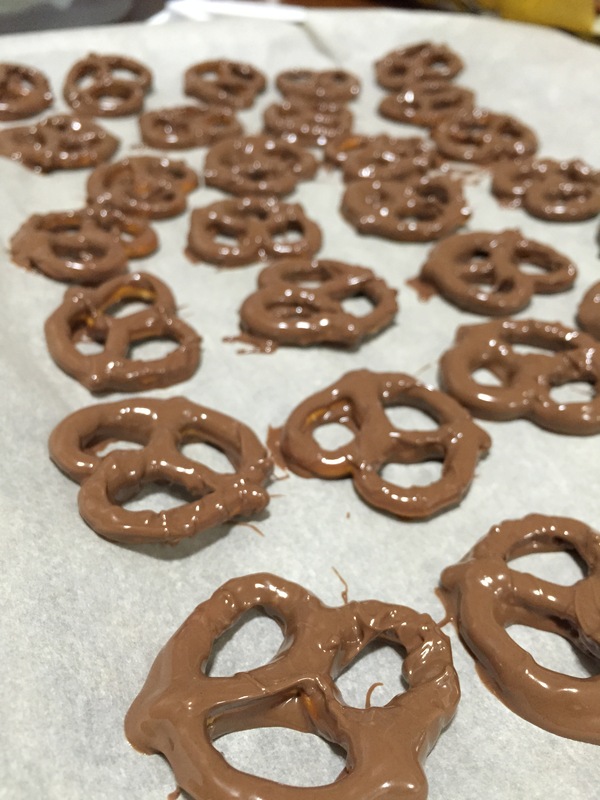 I’ve found this method leaves a good coating of chocolate on the pretzels without having to shake off too much excess. Then the real fun comes in! 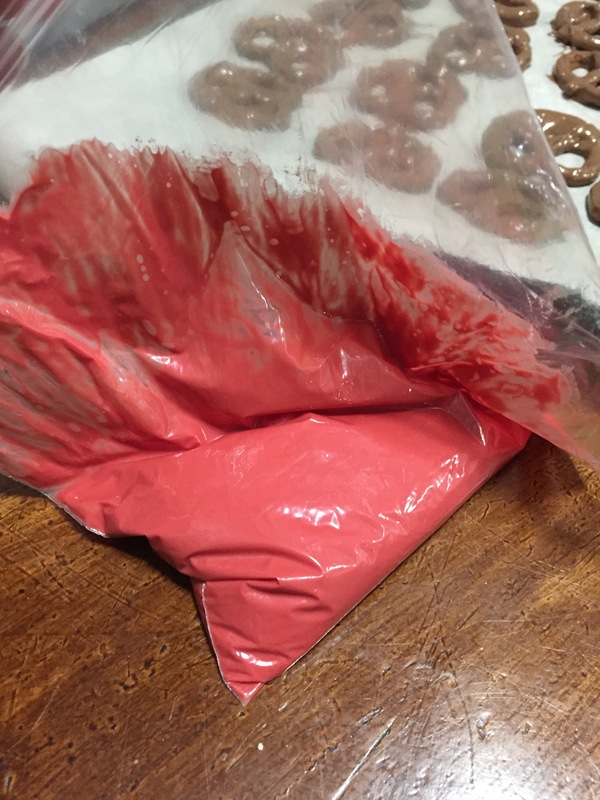 Start by placing maybe a half cup or less of the melting chocolate in either red, green or white in a ziploc type bag. (NOTE: the amount will totally depend on how many pretzels you’re dipping. 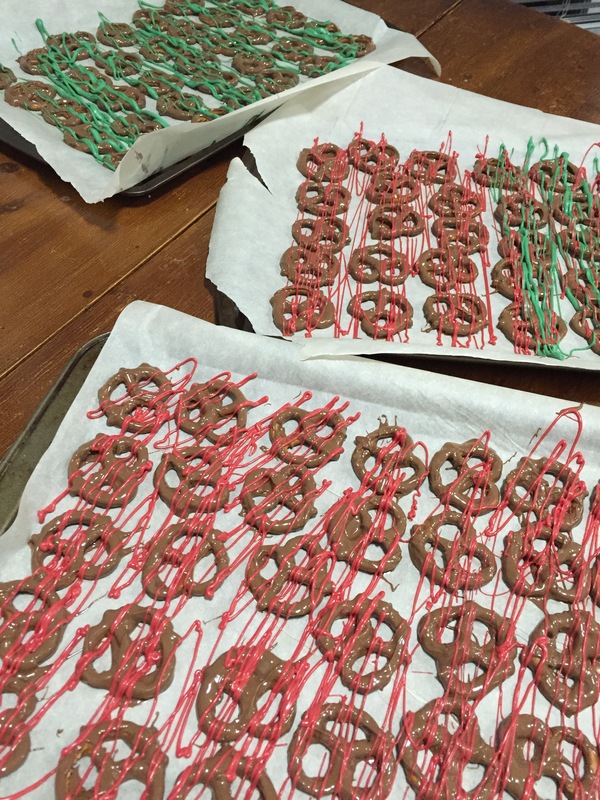 I had about 35 chocolate covered pretzels on each sheet and had five sheets in total). 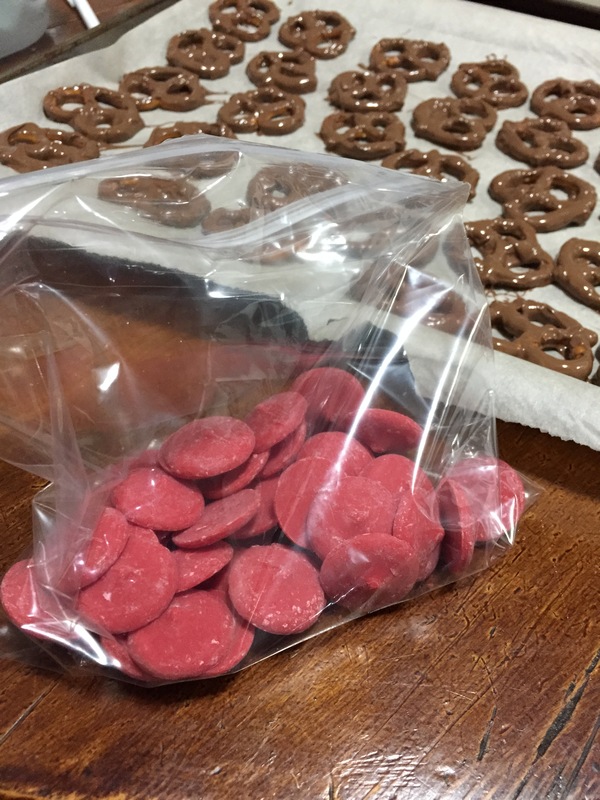 Place all the candy melts in one corner of the bag and pop in the microwave for about 20 seconds. Pull out and gently massage the bag and repeat (microwave/massage) until you get the desired consistency. 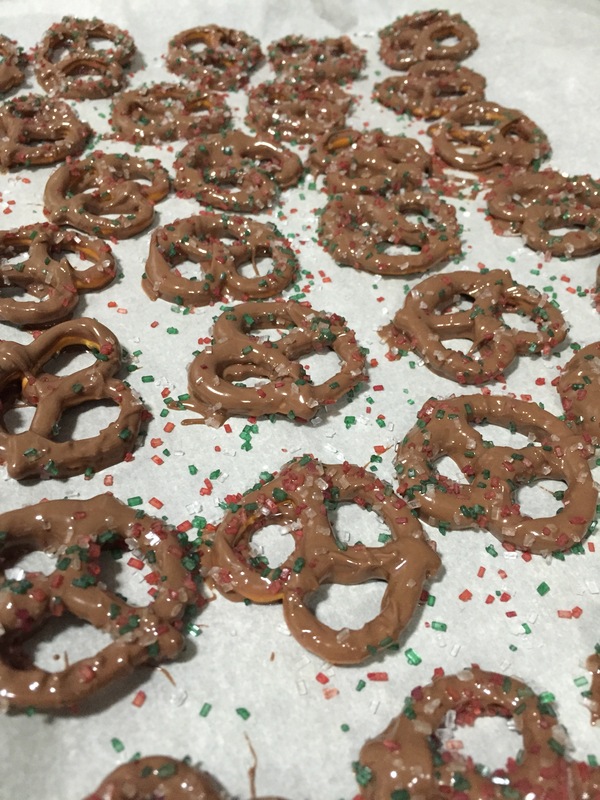 Snip a TEENY hole in the corner and start to drizzle over your chocolate covered pretzels. This is the fun part. Promise. Let your creatively out! The next pans I placed about 4 peppermint candy canes in my magic bullet and crushed them up until it was almost powder. Using a spoon I sprinkled the peppermint sugar over one of the pans. 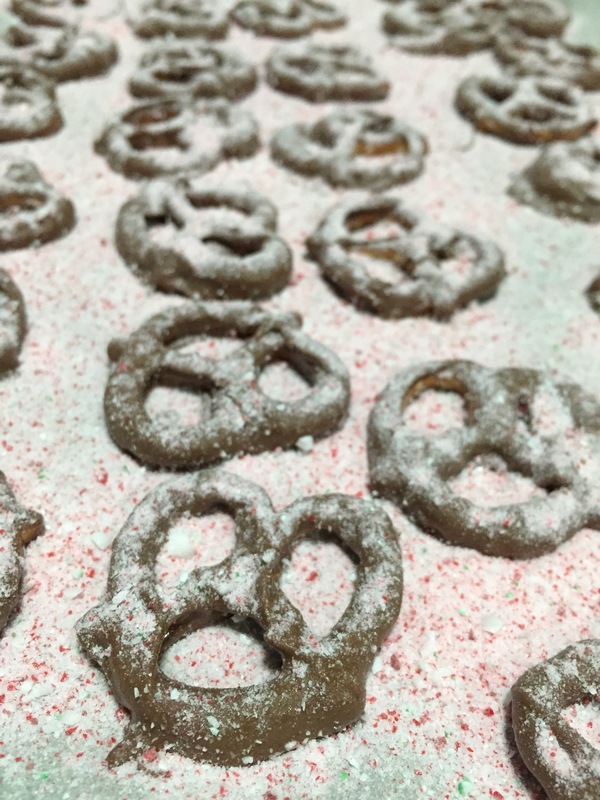 On the last pan I shook festive holiday sugar sprinkles over the sheet. I left all the pans out for a few hours to let the chocolate harden before breaking up off the cookie sheets and placing them in holiday tins for gifting. It’s best to work in batches. 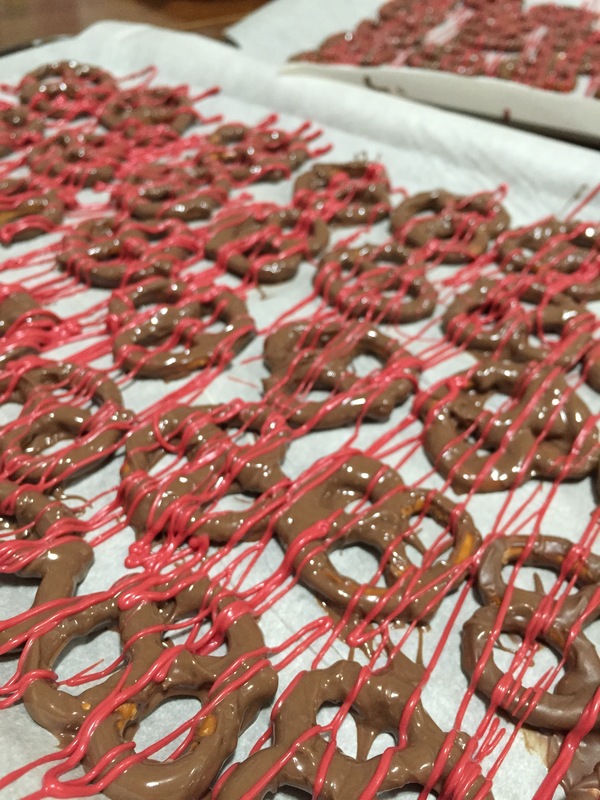 So I’d finish a cookie sheet and sprinkle the candy cane pieces over the whole sheet (while the chocolate is still wet, as it helps it stick). Same with the sugar sprinkles. The coloured melting chocolate though, can all be done at once. I had three sheets done before I used any of the coloured stuff, that way I wouldn’t have to remelt the coloured chocolate melts over and over again. Anyway, this whole process is crazy simple, so enjoy! and Happy Holidays!